Contains One Pair Of Socks. These Lightweight Socks Are Made With Special Therma-Flo Weave. If Lotion Is Applied To The Feet Immediately Before These Socks Are Slipped On, The Socks Provide The Added Benefit Of Locking In The Moisture While Allowing The Feet To Breathe. Helps To Soften And Condition Dry, Rough, Callused Feet. 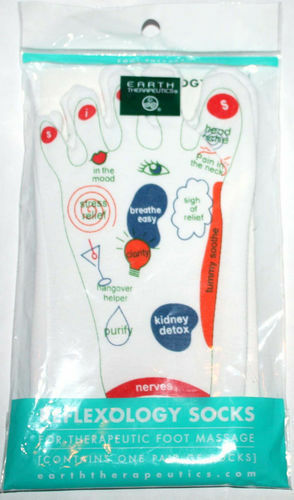 Reflexology Socks For Therapeutic Foot Massage Reflexology Is A Centuries Old Healing Art That Shares Its Conceptual And Philosophical Roots With Traditional Chinese Acupuncture. Reflexology Teaches That Certain Areas Of The Body-Such As The Hands Or The Feet-Contain Pressure Points (Or Reflex Points) That Correspond To Points Located Throughout The Entire Body To Facilitate Self-Massage On The Feet, Use This Chart To Find Your Way Around. This Illustrated Reflexology Chart Is Drawn For The Benefit Of The Person Who Wants To Massage His/Her Own Feet And Therefore, Does Not Have Immediate Access To The Diagram Drawn On The Heels Of The Socks. Note That This Chart Is Specially Drawn From The Viewpoint Of The Person Who Only Has Immediate Visual Access To The Tops Of The Feet (Not The Heels). Keep The Chart (Enclosed In The Bag) For Future Reference. 78% Cotton/10% Poly Fiber/12% Lycra.